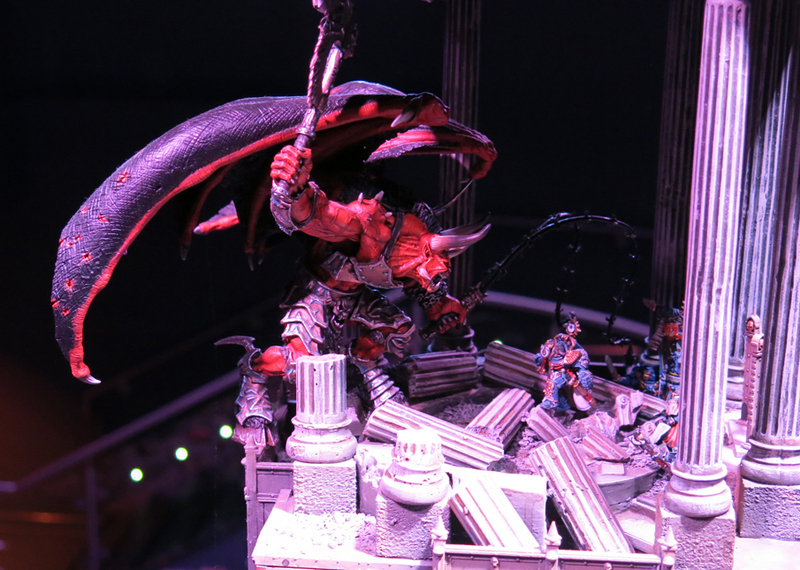 It’s the final post in this showcase of the displays at Warhammer World and this time we’re looking at the big one. 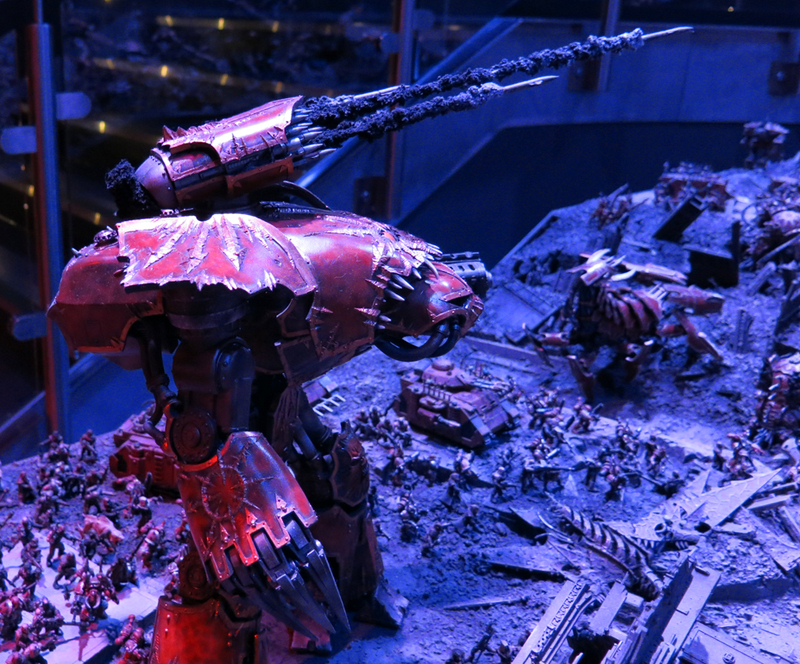 Twenty-two feet from end to end, twelve feet wide and twenty feet tall (that’s almost seven meters long, three and a half wide and six meters tall for those who’re sensible enough to use metric) – it’s the battle for Angelus Prime. To give you a sense of how big this thing actually is there is a man in this picture – another visitor. I didn’t want him appearing in the shot so I waited until he was hidden by the building. That’s right – the human was hidden behind the miniature, usually it’s the other way round! 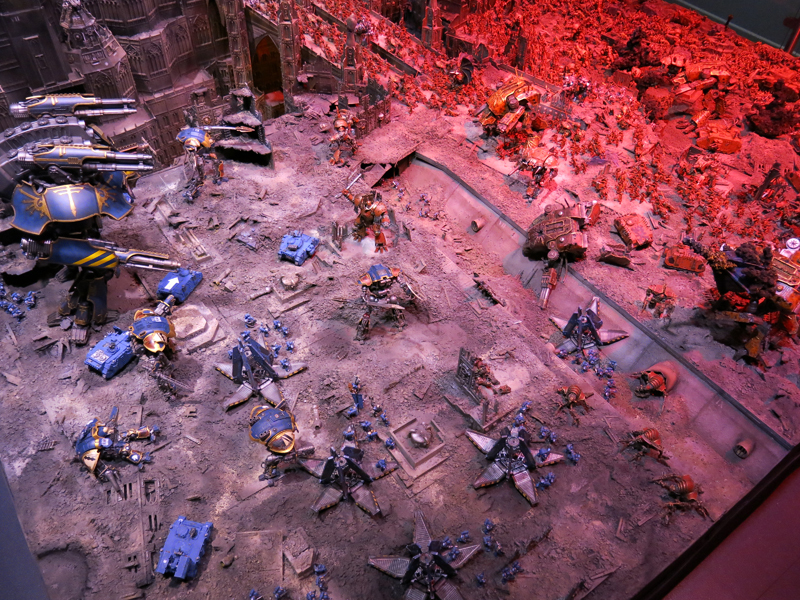 The board captures the forces of Khorne, led by the bloodthirster An’ggrath, battling the Ultramarines who’re attempting to defend Ultramar. 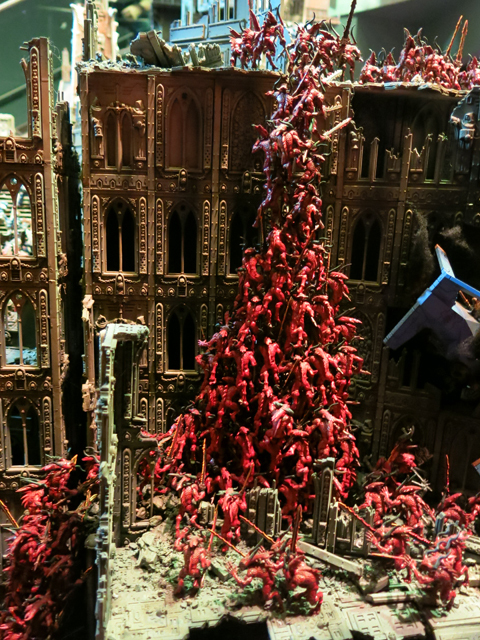 If you were wondering where all the Chaos miniatures were in the 40k displays – here they are. Followers of the other gods need not apply. 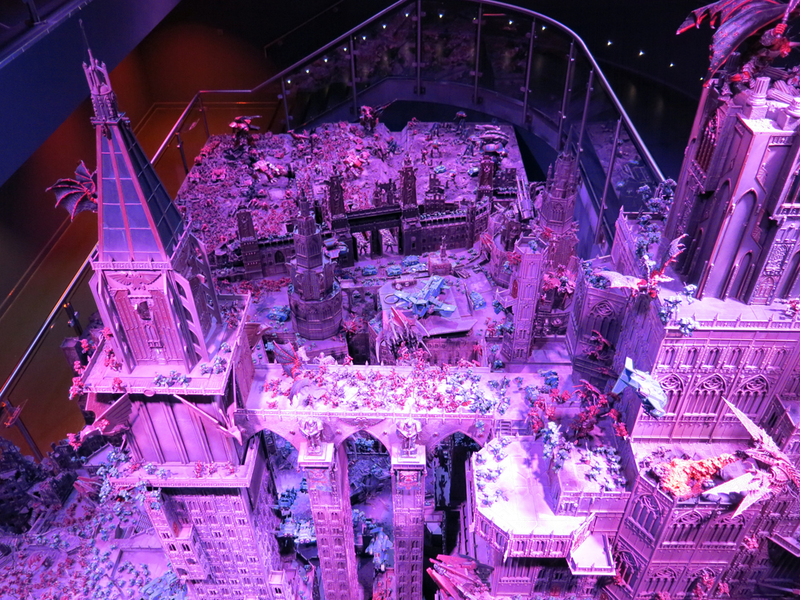 There are over five and a half thousand models on this board, putting any sensible person’s collection to shame. 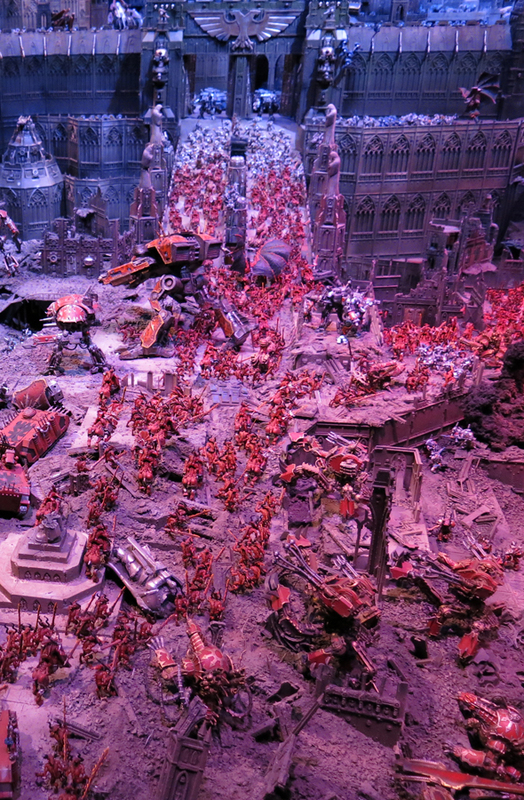 These stretch from swarms of bloodletters and cultists to tanks, knights, even titans. 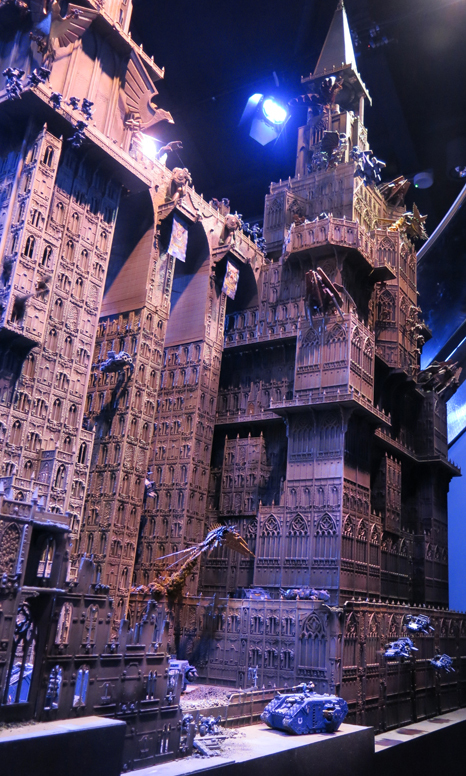 The fortress city itself meanwhile is constructed from over 1,200 scenery kits and took nine months to build. In many ways this is the ultimate aspirational army. 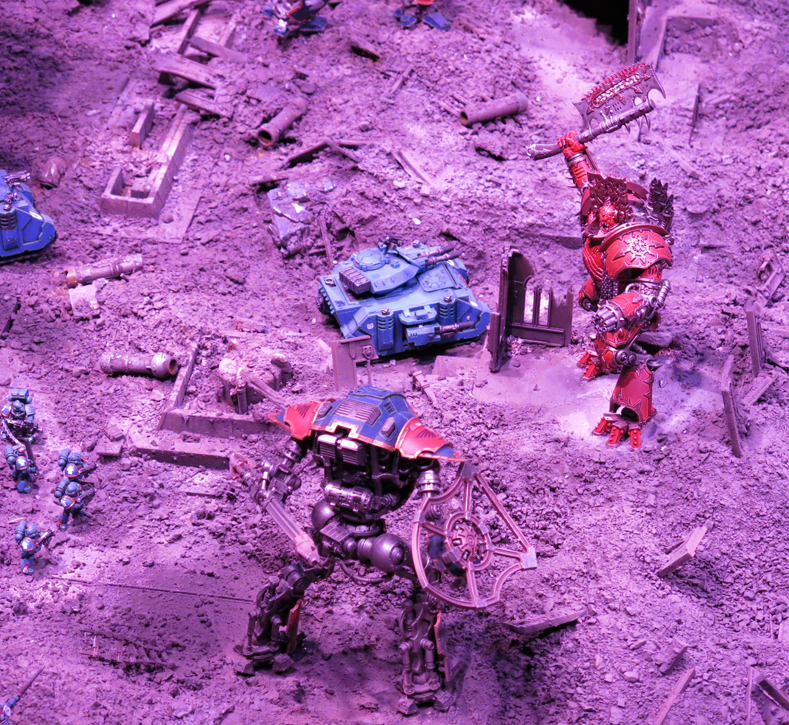 We all dream of what it would look like to have at our command the thousands of infantry, hundreds of tanks, ranks of Titans and so on that our heroes in Black Library fiction posses but, with the exception of epic players, most of us never will. If only time and money were no object eh? 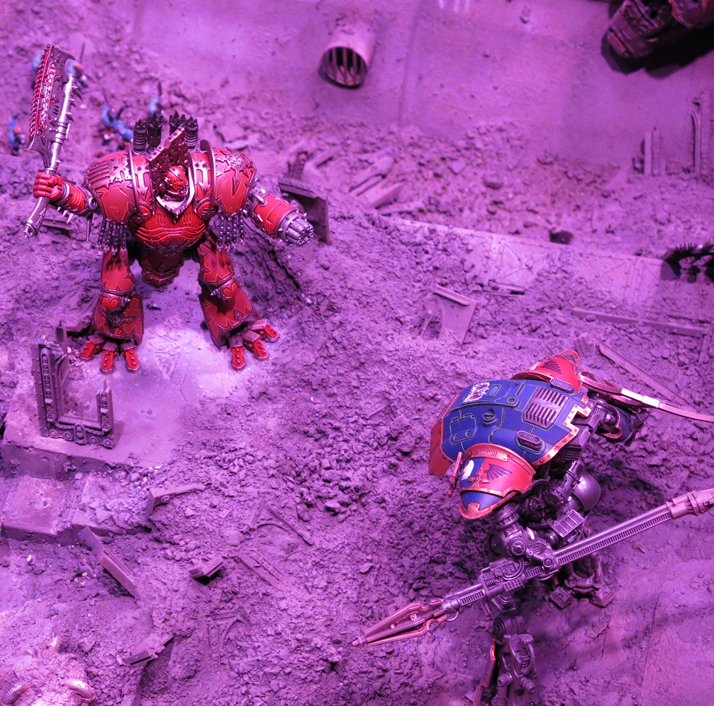 As if the scene wasn’t dramatic enough it also features a soundtrack of dramatic music, overlaid by the clatter of bolter fire and the distant crunch of explosions. 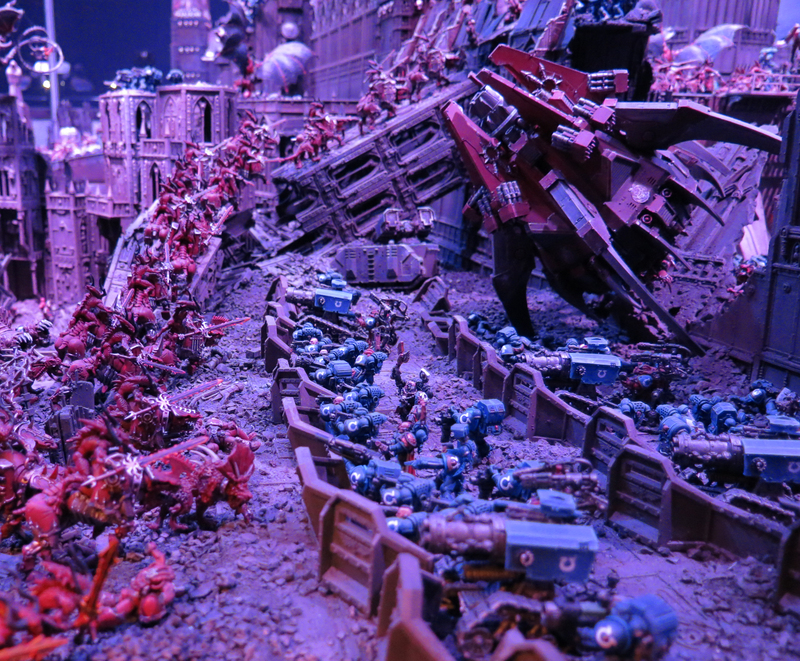 Lights fade slowly from the deep blue of the loyalists to the bloody red of Khorne, adding another layer to the atmosphere. 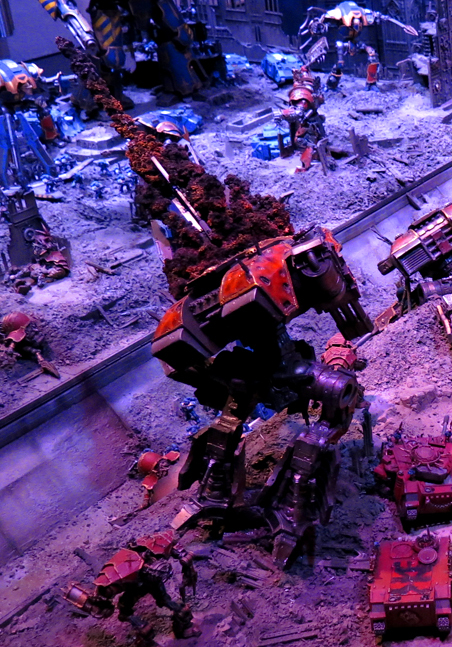 It’s a cliché to say that they make the viewer feel that they are right at the heart of the battle but – minus the discomfort, blinding terror and high risk of imminent death – that’s pretty much what they do. 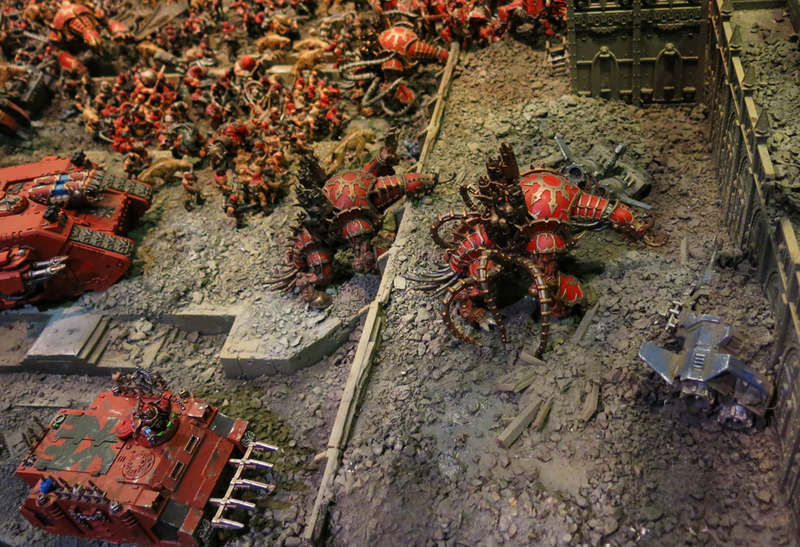 The whole diorama contains a real sense of action, captured through elements like this chaos titan being felled by an off-course drop pod, the bloodletters crawling over each another to climb the walls (above) or the chaos Reaver titan firing its rack of missiles (below). The Warlord Titan. 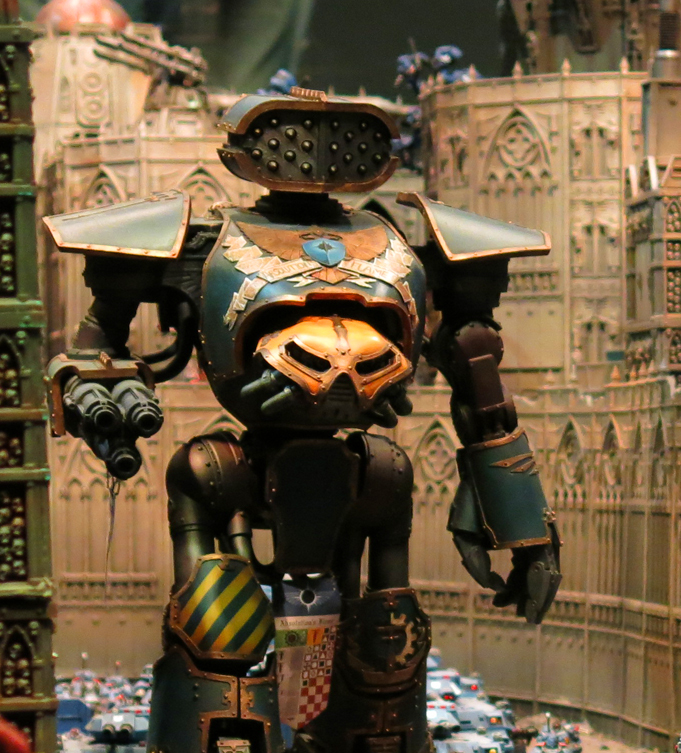 For those still struggling with just how big this thing is those are Knights around its knees. The term ‘miniature’ may no longer be appropriate here. 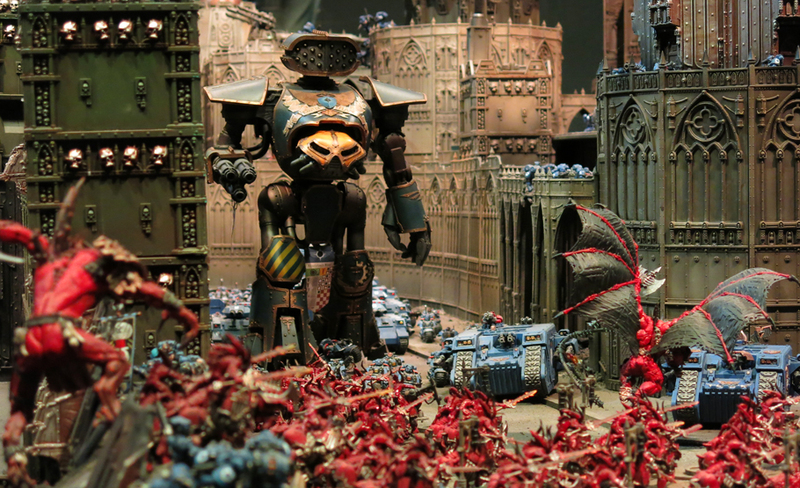 Yesterday the mechanicum were fairly certain they had a gun. But no, it turns out this is a gun! I understand we shouldn’t expect it to tire any time soon… Even a full scale planetary invasion wasn’t enough to distract these two from their World of Warcraft addiction. 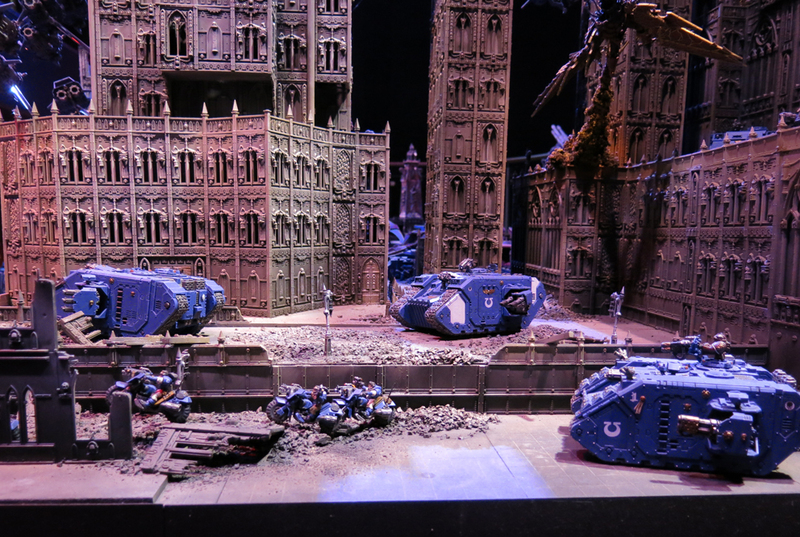 One of the most famous things about this board is that, in amongst the five thousand five hundred plus other models lurks one lone Vindicare assassin. If you can find it you can win one of your own and I was certainly planning to give it a good go, until I actually got there and realised what a painful, eyeball straining challenge that would be. However I was lucky enough to be standing next to the man who did. What impressed me most – apart from the bushiness of his beard, something for which he deserves extra credit – and the sharpness of his eyes (seriously, don’t even try unless your day job is as an eagle) was the logic with which it was placed. I understand the model moves around (not by itself – that would be slightly creepy) but even so I don’t want to give away too many spoilers so that others can enjoy the challenge of the hunt themselves. However the finder did explain that he focussed his attention (and presumably eyeballs that are the envy of the Hubble telescope) where he did because that location would afford the assassin a clear shot without being detected himself. 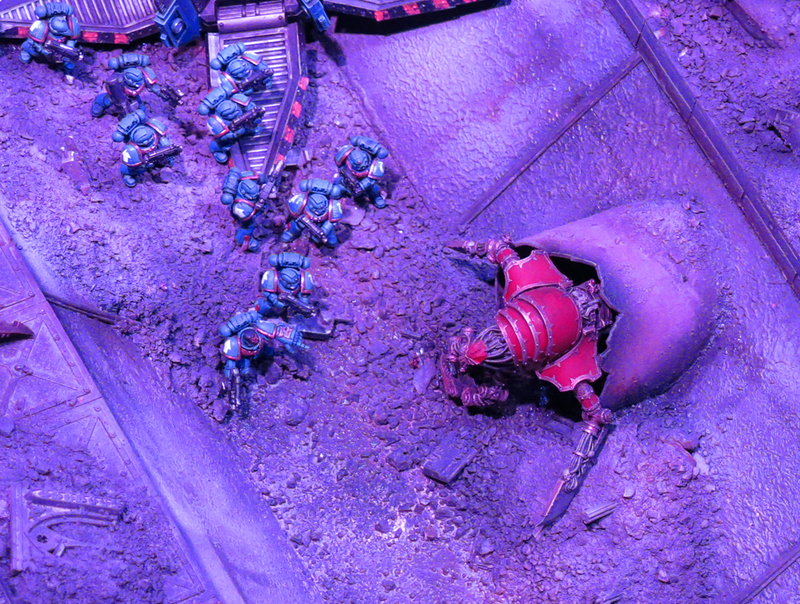 In his hiding place he could crouch out of sight, allowing the ranks of the World Eaters to pass him by before shooting whomever his intended victim is. To me that represents an attention to detail that makes the piece even more impressive – they didn’t just stick him down the back of the radiator and think “no one will look there!”, they followed through the narrative of the piece and allowed a person to find it not by luck or simply sharp vision, but by joining them in the logical process and by investing their imagination in the story. 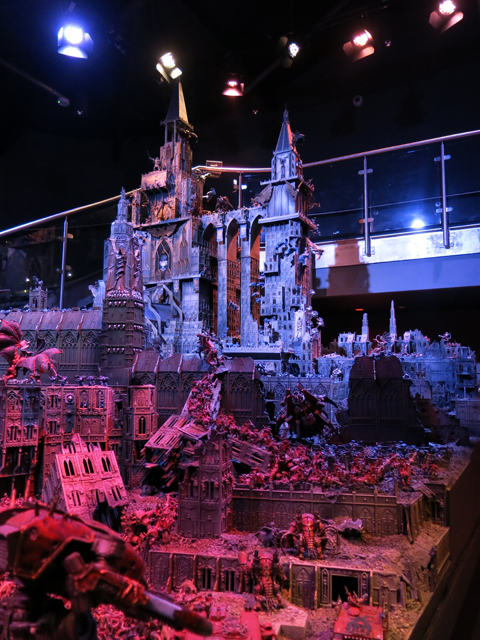 So there we have it – my day out to Warhammer World spread over a full week of posts. Once again I hope this has been as interesting and inspiring for you as it was for me. 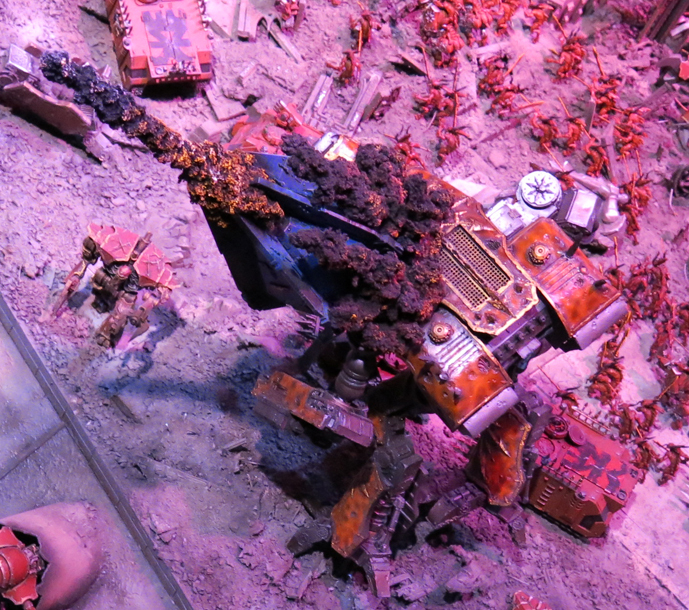 Check back tomorrow and, all being well, I’ll actually have a miniature of my own to show – my Dreadtober contribution roaring in at the very end of cheat week! Until then, as ever, I’m interested in your thoughts – so make them known in the comments box below. 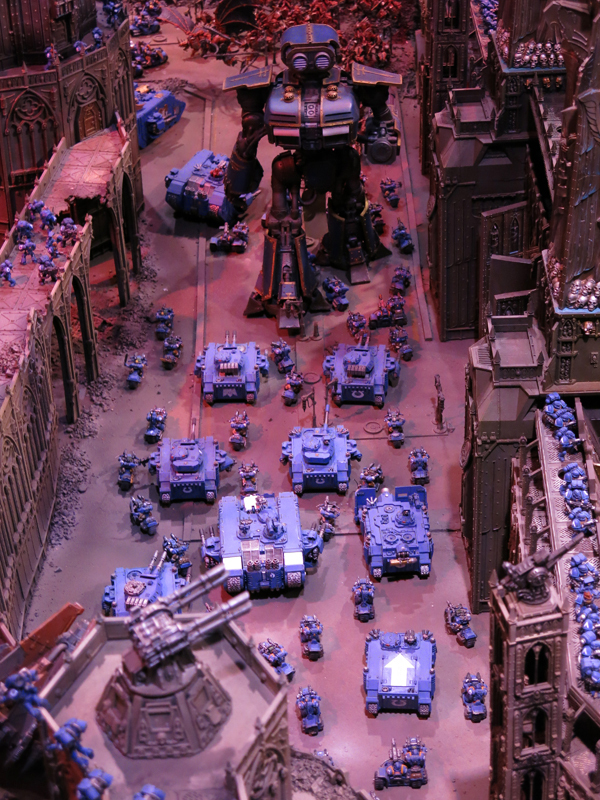 Look at almost any piece of artwork showing the Imperium at war and there they are, striding along in the background, towering over the tanks and scurrying foot soldiers; the Titans. 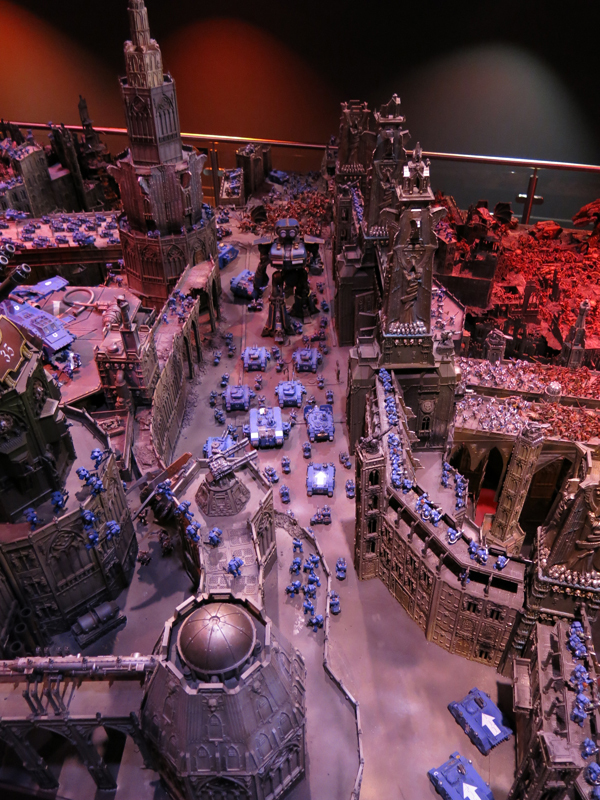 They’ve been part of 40k for such a very long time, yet for most of us they’ve been out of reach, the preserve only of those rich enough to afford the Forgeworld kits or spectacularly talented and able to build our own. 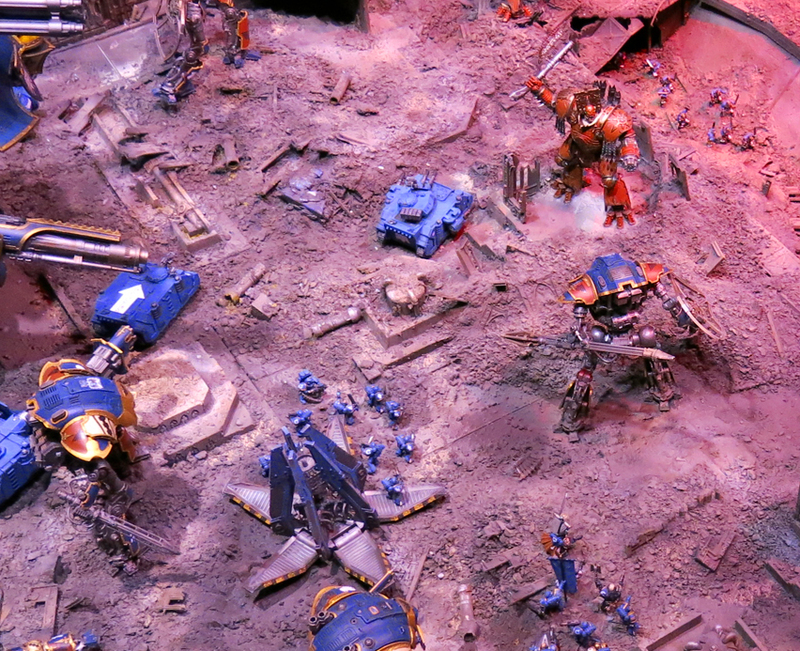 My fingers were crossed from the moment I saw the Riptide, then the Wraithknight came along and sealed the deal. Surely, surely an opportunity was not to be missed? 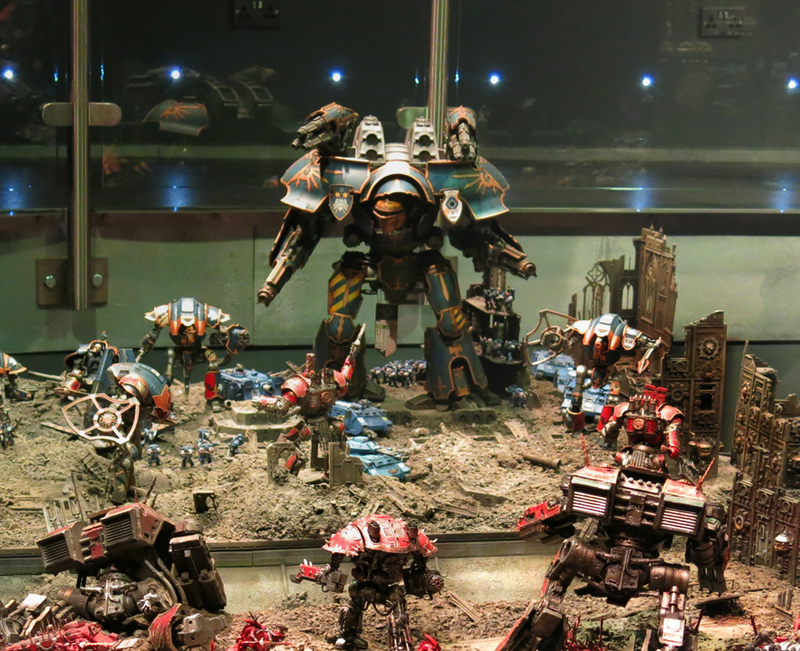 The Imperial Knight must, at last, be on its way! Thankfully when it did emerge the Knight did not disappoint. Hard to believe really that it was a year ago now. As soon as I saw it I wanted one, I just wasn’t sure if I could actually make a decent job of painting it. After all I’d never attempted anything even a fraction of the size, and as I’ve noted before I can be a bit of a coward when it comes to the bigger kits and this beast is one of the biggest of them all. Finally there’s the fact that I wanted to do some fairly major conversion work to it. Much as I love the heroic knights who stride out in defence of the Imperium I’m an unrepentant traitor at heart and I wanted something far darker and spikier than the official kit. My imagination had set the bar pretty high and I admit I was a little afraid that my skills might not match it. By September last year I’d finished one leg. Yes that was a long time ago wasn’t it, thanks for reminding me. Not to do it down, I’m pretty pleased with that leg, but I’d be the first to admit there was a way to go yet. Well, it’s taken a little while but here’s progress at last – a whole other leg, and a banner to go with it. Here’s a close up of the banner. With the legs done I’m ready to start on the torso and head. This is where my ambition might outstrip my ability as I’ve got some fairly grand and convoluted plans in mind. Updates might, therefore, remain a bit thin on the ground – this was never going to be a project I finished fast and if I’m to pull off what I’m looking for the learning curve will be quite steep. Never mind, I’ll give it my best shot and let’s see what we end up with!